CHARLOTTE, N.C. -- 2015 marked a banner year for solar power in North Carolina as Duke Energy companies set a record for the amount of solar energy they added in the state -- more than 300 megawatts (MW), enough to power about 60,000 average homes at peak production. In its regulated service territory, Duke Energy committed $500 million for a major expansion of solar power in North Carolina. Last year, the company constructed and now owns four utility-scale solar projects totaling 141 MW and is buying 150 MW of solar power from other developers. 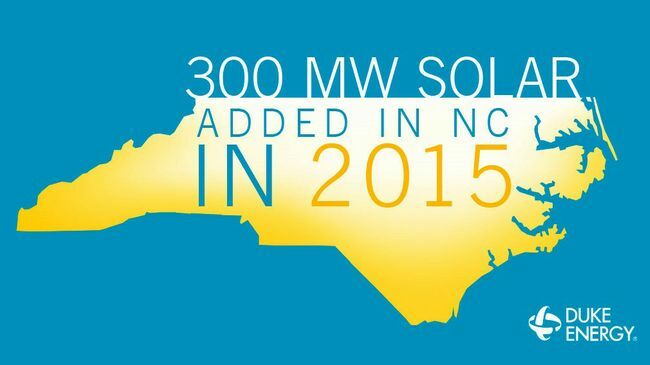 The 141 MW represents about 25 percent of the total installed solar capacity in 2015 in Duke Energy's North Carolina service territory. The company-owned sites are in Bladen, Duplin, Wilson and Onslow counties. At the Onslow County site, the 13-megawatt Camp Lejeune Solar Facility is the company's first solar project located at a military base. "Solar is helping to modernize our generation mix and better serve our customers' needs," said Rob Caldwell, senior vice president, Distributed Energy Resources. "We plan to continue the momentum; we've already announced we will build an additional 75 megawatts in 2016." Also in North Carolina, Google was the first customer to announce participation in Duke Energy's Green Source Rider, a program that gives customers the option to purchase renewable energy to offset new energy consumption. Duke Energy will buy the power from a 61-megawatt solar project, owned by Rutherford Farms, LLC, for Google's expanded data center in Caldwell County. Also in 2015, Duke Energy Renewables, a commercial business unit of Duke Energy, built eight solar projects in North Carolina, totaling more than 160 MW and representing an investment of nearly $400 million. This included the 80-MW Conetoe facility, the largest solar project brought on line east of the Mississippi, and a 5-MW project in Tarboro that was completed on Dec. 31. "With these projects, Duke Energy Renewables more than doubled its solar capacity in the state last year," said Greg Wolf, president, Duke Energy Commercial Portfolio. "We're proud to partner with communities throughout Eastern North Carolina to bring competitively priced solar energy and economic development to the region." The U.S. Energy Information Administration says North Carolina should be second only to California for utility-scale solar construction in 2015. Duke Energy's investments in the state have been instrumental in North Carolina ranking fourth in the nation cumulatively and No. 1 in the South for solar capacity. In addition to its owned solar generation, Duke Energy also buys about 1,000 MW of solar energy through power purchase agreements in North Carolina. Since 2011, Duke Energy Renewables has constructed 25 solar facilities in North Carolina, representing 270 MW and an investment of about $700 million. Over the past eight years, Duke Energy has invested more than $4 billion in wind and solar facilities in 12 states. The company plans to invest an estimated $3 billion in renewable energy over the next five years.